Requesting information via our website, by phone, by mail (whether postal or electronic format) or in person. Making a donation or contribution (whether via website, phone or mail). The above list provides a sample of personal information that may be collected by Swiftwater Search & Rescue. On occasion we may collect information in ways not expressly described above. We will not sell, trade, or share your information (collected on the website or through any other business activities) with anyone else without express permission. We will collect payment details, billing addresses, and other information necessary to process a donation or event registration. We will use your information to comply with all applicable state and federal laws, in the good faith belief that such action is necessary to conform to any legal process served upon us, to protect and defend our legal rights or to act in urgent circumstances to protect the personal safety of others. We will protect your information against illegal fraud. We may verify with third parties the information collected in the course of processing a gift, event registration or other donation. If you use a credit or debit card, we will use card authorization to verify that your card information and address matches the information that you supplied to us and that the card being used has not been reported lost or stolen. You have the right to review information that we have collected about you. 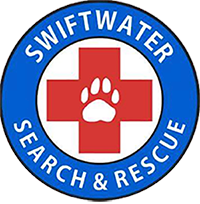 To review that information please contact us in writing at info@swiftwatersearchandrescue.org. Due to the nature of our nonprofit, all donations are final and donations can not be returned.